Jean Burks says her life was about base metals. Then she got a master’s degree in musicology. Now, she spends a lot of her time thinking about quilts. There is a logical explanation for all this, and it serves to describe one woman’s unique trajectory as a solver of mysteries, a chronicler of history and a shameless collector of stuff. Aside from possessing the omnivorous curiosity of a reference librarian, Burks has had a lifelong fascination with old objects. She credits her parents for the latter; their idea of a good time was nosing around antique and secondhand shops, and their house corralled an ever-changing assortment of vintage wares. Her mother, Burks says, was fond of candlesticks and continued to “trade up” over the years until she acquired the beautiful Irish silver pair she’d coveted. Burks attributes her own focus on metals to the evolving series on the family’s dining-room table. This time, her degree was in the history of European decorative arts, and her thesis had to do with, yes, candlesticks. Specifically, Burks researched and wrote about the “seven mysterious people whose names were on all these products” made in 18th-century Birmingham, England — then an epicenter of manufacturing in Europe. From base metals, which Burks calls “the workhorses of the decorative arts,” her interests expanded, most notably to Shaker furniture. In fact, she became an expert on that distinctive, spare design. Burks and coauthor Timothy D. Rieman penned three authoritative tomes on the subject, beginning with The Complete Book of Shaker Furniture in 1993. And the quilts? We’re getting there. The succinct description of Burks’ Shelburne Museum job on her résumé leads the way: “Responsible for the acquisition, publication and interpretation of decorative arts collections, to include furniture (2000), glass (1000), ceramics (3500), metals (4000), textiles (1500 quilts, coverlets, rugs, samplers), recreational artifacts (3000 dolls, dollhouses, toys) and tools (2000).” Talk about multitasking. 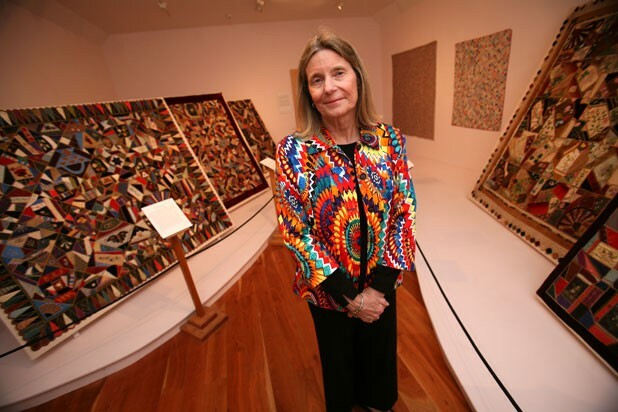 Burks has embraced her textile charges with a characteristic mixture of academic rigor and a collector’s joy of discovery. When she leads a visitor through this season’s exhibition in the Hat and Fragrance Textile Gallery, her delight is contagious. And no wonder: The remarkable selection of crazy quilts from the Victorian era into the early 20th century is wildly eclectic, each quilt expressive of its maker’s personality and interests, from little paintings to political ribbons, from birds to what then passed for bling.